« A Window for Carpet? As promised, the carpeting of the third floor and back stairs is complete! Of course, since we changed the color of the carpet from blue to tan, it will also mean re-painting the stairwells and hallways, which are now gray, but will soon be a pale yellow/gold. 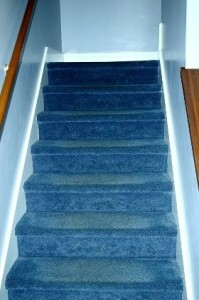 As you can see from the first photo of the rear stairs, the blue was very pronounced, and it was time to replace the carpet. 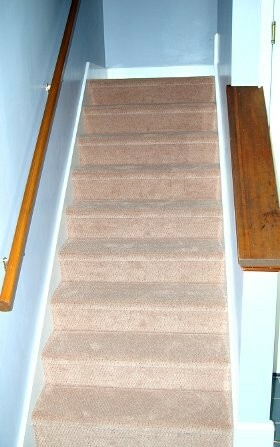 The second photo shows the back stairs with the new carpet, while the third photo shows the new carpet at the third floor landing. Of course, the need to re-paint the halls and stairs raises the question of what else will be done this winter. To tell the truth, we have quite a long list. In fact, the list is long enough that we fear we may not be able to complete it all, so any parts that don’t get done this year may have to wait for next year. We hope to install gas (propane) fireplaces in a few of the rooms. We will be meeting with a fireplace company to see what they recommend, but we would love to have some nice fireplaces in at least some rooms. If we can find good prices, and if the installation is feasible, we hope to have some in before Spring. 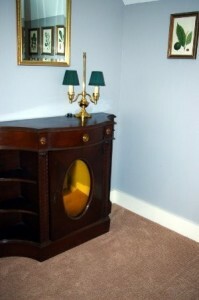 Most of our guests know that we have painted a couple of rooms each winter. We do hope to paint at least one, and possibly more rooms this year. We also plan to paint some bathrooms and install new light fixtures in those baths that don’t yet have the new fixtures. We have a longer list than this, but now we’re venturing into the area of things we may not have time to do this winter. If we do manage to get them done, we’ll be sure to post pictures and let you know. By the way, one thought we have is of putting televisions in some rooms. In our informal conversations with guests, about two-thirds would prefer not to have TV’s in the guest rooms, and 1/3 would like to have them. Do you have a preference? Please either send us your opinion or post a comment to let us know!